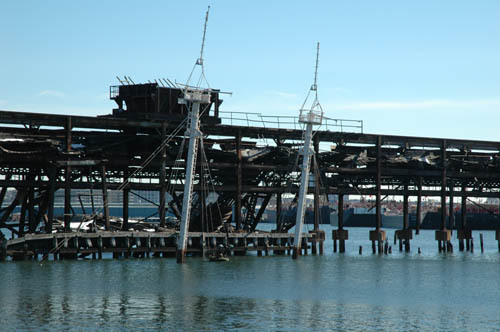 Ever wonder about that sunken lightship in Red Hook by the Revere Sugar Plant whose masts were poking out of the water? The ship was reportedly removed from the water on Sunday by a massive crane floated into the Erie Basin by Thor Equities. We came across this flickr set of the lightship's actual sinking in the mid-1990s and thought we'd share in case you were curious and (like us) had never seen pics of the ship that had sat at the bottom. You can check out the entire set here or the slideshow of the set here. Below is one of our pics of how the lighship appeared until a few days ago. Very interesting. Always wondered about that ship. I must saw you get a lot of posting done each day. Good work.